There are certain dishes you ought to recreate if you want to capture the essence of those childhood days. And the next few posts will be in true sense of those moments. I have heard hubby talking so much about his childhood days spent eating these delicious evening snacks, that I always wanted to visit his hometown just to taste these snacks that he keeps talking about. Amma used to make Mirapakaya Bajji with those special chillis that are not spicy, but only after marriage I was introduced to these bajjis that are made with the regular green chilies. Now I came to know later that in Ananthapur, you get a variety that is not spicy at all. I have tasted it and was wonder-struck that a chilli can look so green, yet wasn’t hot! But it is true. Still even there you got to search for it and get it right, else you end up with a hot spicy chili. But guess what the kids who grew up there can easily eat a spicy stuffed chilli without battering an eyelid. I have seen my nieces and nephew doing just that and even I won’t venture. So when Athamma makes it for me, she makes sure she sautes it and makes it less spicy. Last week when I was discussing with hubby dear on his childhood food that he might want to eat again, he was telling me about all these different snacks that gets done on the road side eatery shops and I could sense and see a twinkle in his eyes, he was transported to days bygone, and with a sign ended saying those were the best time. I have already posted on how Athamma makes the Mirapakaya Bajji and yes I have also captured a Video with Athamma making the Mirapakaya Bajji knowing very well that this is something you ought to see to get it right, let me tell you even after seeing it’s hard to get it done the right way. So I choose the easy way out and request Athamma to make this always. My kids love Uggani, which again is a specialty dish from Hubby dear’s hometown. Imagine my joy knowing that I get to eat such delicious dishes on regular basis. Though I have learnt to make the perfect Uggani, getting the chili right is not yet done. These posts are the ones I posted during the initial period, I am yet to get back to updating the pictures. But I guess you will enjoy reading on them. I made Uggani for dinner last night and kids loved. I wanted to make sure get the Masala Mirchi Bajji done too. When hubby dear walked in home, he was happy being greeted by an aroma that was tantalizing. With hurriedly clicking pictures of the finished snacks, we enjoyed! Agreed it was spicy though he didn’t show any reaction. 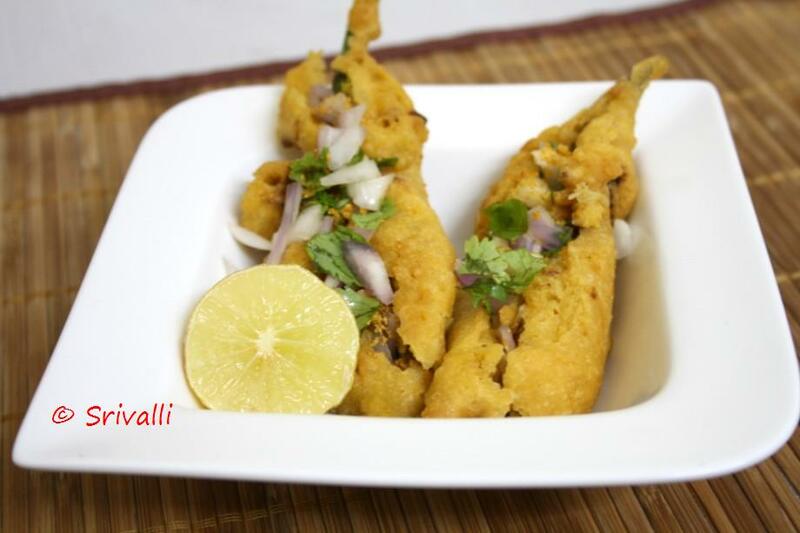 Step by Step pictures for making Masala Michi Bajji. Another stuffing is with roasted fried gram, chili powder, salt and garlic. Chillis stuffed with different masala. Heat the oil, when it is hot fry the stuffed Bajji dipped in Besan. Stuff it with finely chopped onions, coriander leaves. Top it with spice powder that is made with fried gram flour, Red chili powder garlic and salt. This is served with Uggani. 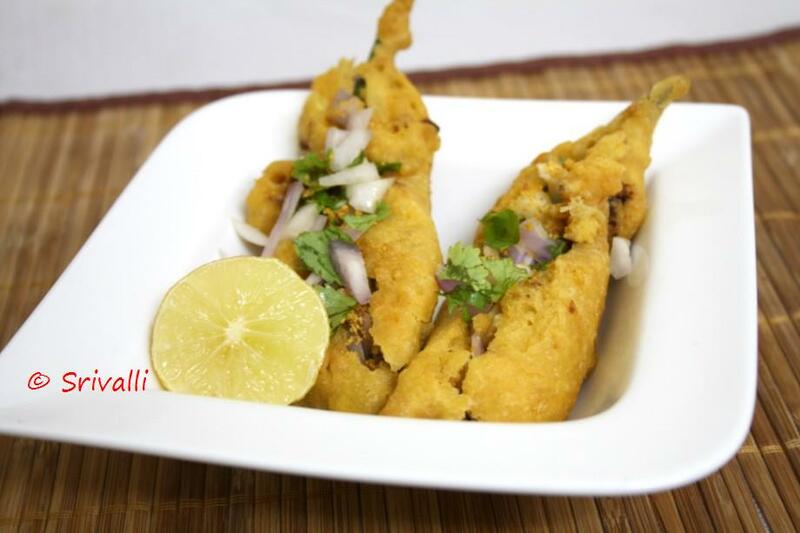 Konda normally loves to eat these spicy Chili bajji, by eating just the outer layer of Besan. It will still spicy stuff. Note: These are regularly made with chillies that are sauteed ones for the kids, which are not very spicy. But kids growing up in Anantapur eat this as they are used to it. Sending this to Kid’s Delight,– hosted this month by Champa themed on Restaurant Recreations. I hope she accepts this! Check out the 11 bloggers doing the Marathon along with me..
Bajjis look yummy. Spicy and delicious. Oh my goodness. I am literally drooling over these bhajis. I don't get that kind of chillies here. Thanks for the entry. u r bringing back memories to me!….too tempting! Love mirchi bajji! Your look very nice. i love these whenever i visit andhra hotel one at t nagar i order this they tatse yummy .. This is absolutely a andhra dish and yet loved by al parts of the country.Thanks for sharing. Very addictive and yummy mirchi bajji,yummm! Looks so delicious but I can't stand spicy stuffs.Hubby would love them though.My lil one is just like Konda,she eats the besan covering and leaves out the bajji vegetable!!! Mirch bajji looks so crispy and tempting snack! I am drooling all over it! yummy! i love to try such bajji, wil try it and post the pic to u soon..
Love the mirchis coated in besan. They are the best and the most sumptuous pakoras/side dish. I just love to have it and will surely try out ur version, sounds great ! Am hungry now and so much want to have these!!! Mirchi bajjis look so nice n quite tasty.. I used to eat this roadside and totally craving for it now! Love these bhajjis. Looks very tempting. Mirapakaya bajjili ummmmm one of my all time fav.looks so tempting.